Once upon a time during the Cold War, Paris had a fair number of Russian restaurants, selling the image of an early-20th century White Russia gorging on caviar and vodka while singing and dancing. The collapse of the U.S.S.R., however, was followed by a progressive loss of interest in (and a brutal update on the reality of) Russian culture, and most of these restaurants eventually closed. At the same time, the mass exodus from Eastern Europe to the West brought a variety of nationalities to Paris and elsewhere. 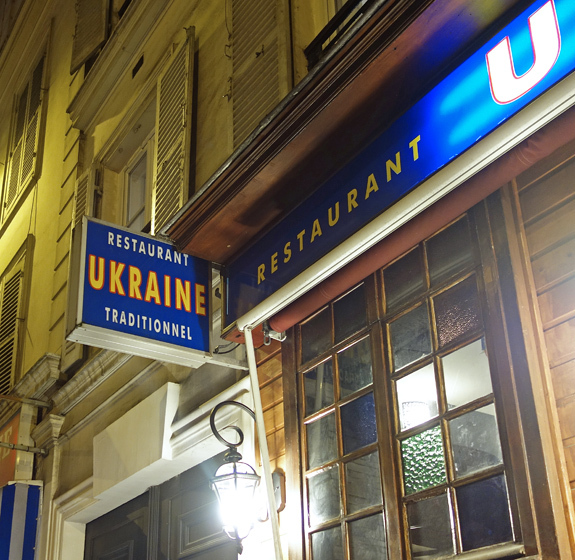 Which is probably how we end up today with a place like Resto Ukraine, a restaurant in the 9th arrondissement, with a Ukrainian chef and an Uzbek waiter. The header on the menus at Resto Ukraine still reads “Restaurant Zakuski”, and one has to wonder what goes through the minds of restaurant owners sometimes. Did they just wake up one morning, decide to rename their establishment to something as in-your-face as possible, throw rocks at their old neon sign, and replace it with a new one? Didn’t “Zakuski” better satisfy the French taste for names that sound cute and silly? Who knows. Regardless, the menu offers a good selection of specialties either Ukrainian (borscht, galubtsy, vareniki), Russian (blini, cutlet Pozharsky) or Soviet-ish (salad Olivier, herring under a fur coat, chicken Kiev). 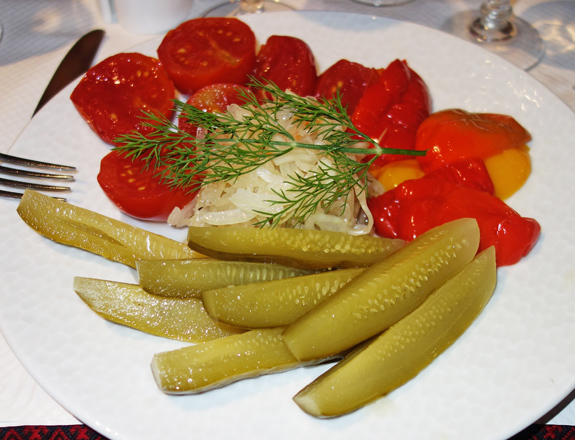 Plus the inevitable food from the grill (shashlyks, chicken), and a few dishes for the oddballs who come to a Ukrainian restaurant in Paris to eat French food (snails, sirloin steak, grilled fish). Let’s take a look at the food. 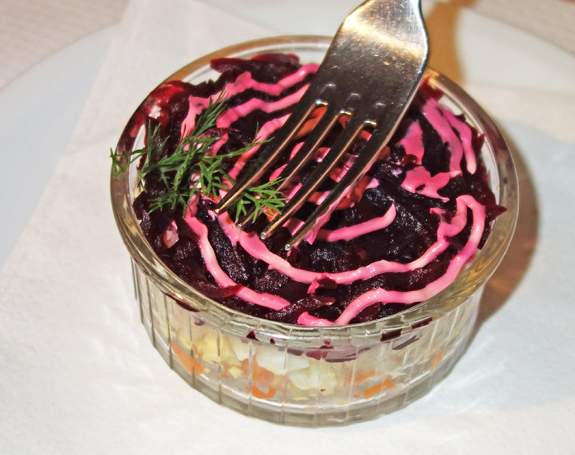 The Russian malossol plate was an assortment of marinated vegetables (malossol means “little salt” in Russian). The cabbage was excellent, similar to a very good sauerkraut, and so was the tomato, salty and slightly sour, very flavorful. I don’t really like gherkins, though, and I don’t remember what the peppers tasted like. The plate was served with real black bread straight from the Motherland. 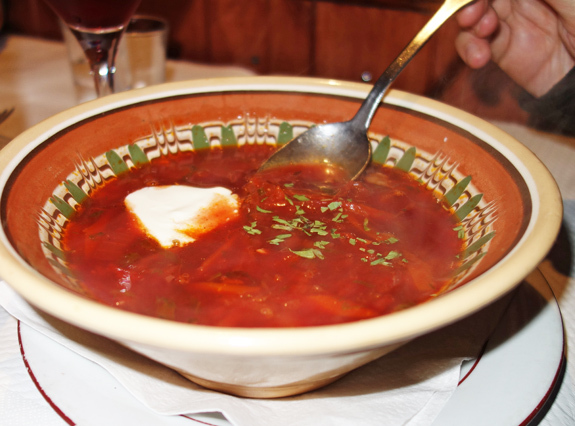 The traditional borscht, with beets, cabbage, and carrots, was another well-executed classic, this one typically Ukrainian. The soup wasn’t too sour or too earthy. The menu also mentioned beef, but we have no recollection of it — it might have just been there to flavor the liquid. 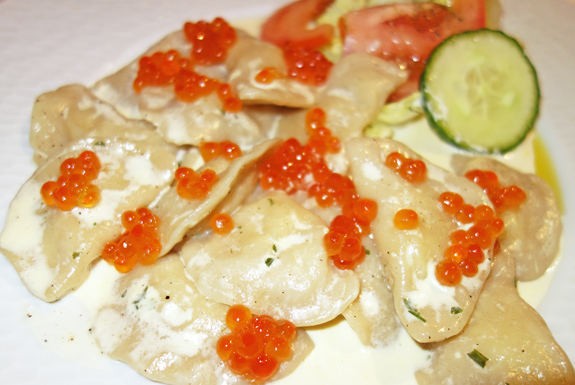 The potato vareniki with salmon roe, called “the tsar’s vareniki” on the menu, were the dish I liked the most. The vareniki, with soft mashed potatoes inside, were just good by themselves. But the roe and the cream sauce really made the dish great. The dumplings can also be had with onions and bacon, mushroom sauce, or mozzarella, but I doubt any of those toppings would be as successful as the salmon roe — and the price was quite reasonable. The pelmeni, on the other hand, were just OK. The beef filling tasted good, but the dough was a bit too thick. They’re also available with the same toppings as the vareniki (minus the fish roe), which might have improved the whole. 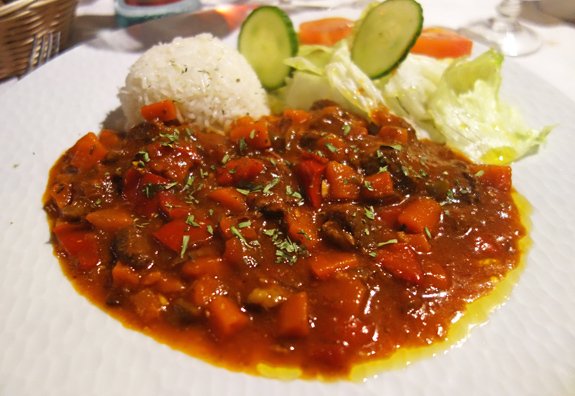 Moving on to the entrées, the Cossak goulash was a Carpathian version of the Hungarian classic. The very tender chunks of beef were surrounded with lots of carrots, so the dish tasted a lot like, well, beef and carrots. It was served with plain basmati rice — not very Russian, but I love basmati. Was the cook making Mickey Mouse ears with those two slices of cucumber in the salad? 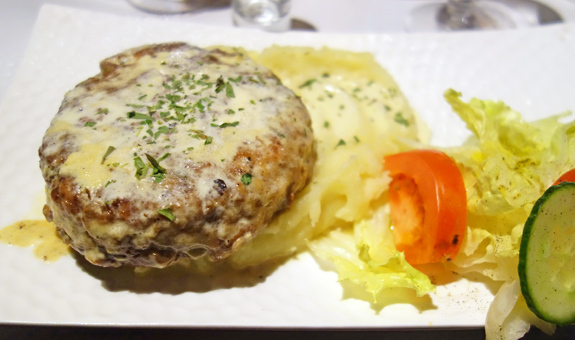 The Pozharsky cutlet challenged the definition of the dish. To most people (myself included), a Pozharsky is made of white meat such as veal or chicken, bread, and cream. This version was a ground meat patty made with 50% chicken and 50% beef. I liked it, but it wasn’t a Pozharsky to me. Of course, what the original historical recipe really consisted of is anybody’s guess. The menu also seemed to mix up tsar names when attempting to give us a bit of history in the description; the cutlets were the favorite dish of Nicholas I, not Alexander I. 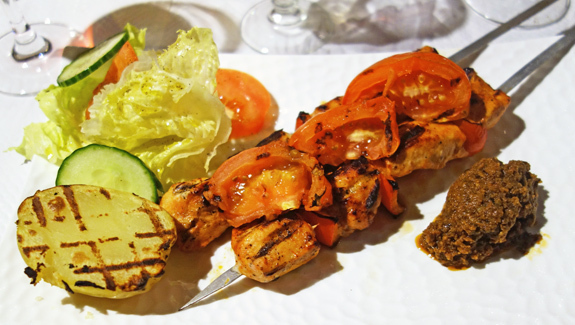 The chicken shashlyk, topped with grilled tomatoes, was tender but lacked salt. It was served with a very rich ajvar, in which I tasted mostly eggplant and olives — a very nice variation on the usual eggplant caviar, and a great pairing with the chicken. 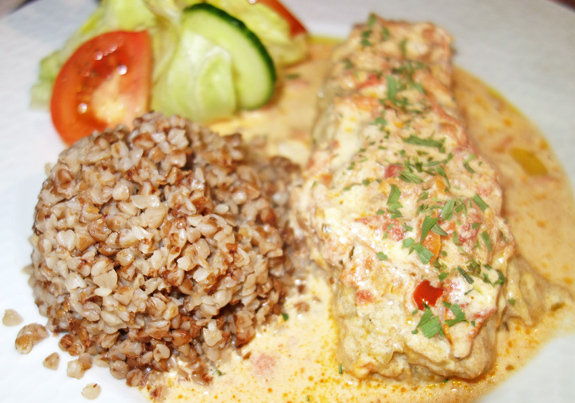 The golubtsy, a large cabbage roll filled with ground beef and carrots and cooked in a cream sauce, was pretty good, especially because it was cooked just right instead of being left in a pot forever like at most Ukrainian restaurants. The kasha on the side was a bit plain. On such full stomachs, at least some of us were brave enough to order a dessert. The menu offered, among other things, tvorog, medovik (honey cake), and a kind of vatrushka (a cousin to the American cheesecake) with morello cherries. We opted for the latter, but were a bit disappointed, as the cake had a funny texture. 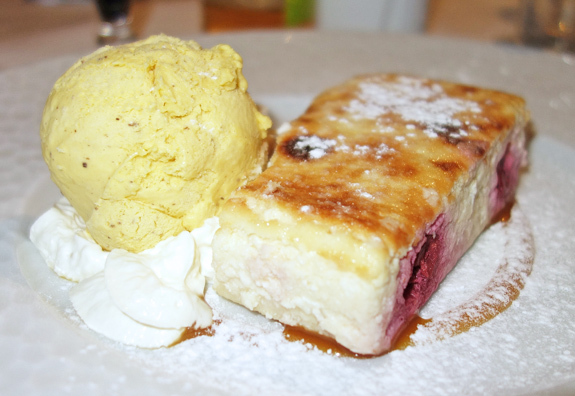 Against all odds, in my vodka-blurred memory, the jaundiced vanilla ice cream tasted good. The restaurant offers a small selection of wines from former Yugoslavia and Georgia (including a rosé, called Khareba, which is kind of a rarity for the region). There’s vodka of course, although I don’t remember seeing a lot of variety (that’s OK: in the end it’s just alcohol with water). The food at Resto Ukraine was quite good, and fun was had. If I were giving it a rating, it would definitely fall into my recommended rating bracket. It’s always interesting to see the ways in which ethnic cuisine changes from one country to the next. The untrained eye and palate might think that Ukrainian cuisine is the same everywhere, especially when it’s prepared by a Ukrainian cook. And yet, Resto Ukraine betrays some local French peculiarities: the basmati rice, plates that overall look much better than what I see in similar joints in NYC, dishes with silly names (“petrushka”, “kalinka”, “matushka” — Russian words chosen for no real reason other than their folkloric notes), and the habit of making “tsar” versions of this and that by adding fish roe. Never mind that there were never tsars in Ukraine! Thank you Florian, we’ll look up your Paris restaurants next time we’re there. After a couple of weeks in the Caucasus I tried to find an Armenian or Georgian restaurant near us, in S-W France. Found a little Armenian resto in Bergerac. Can you recommend a Georgian restaurant in Paris? There seems to have been a palatial one that is – alas – no more – and I noticed “Deda”. Any ideas? 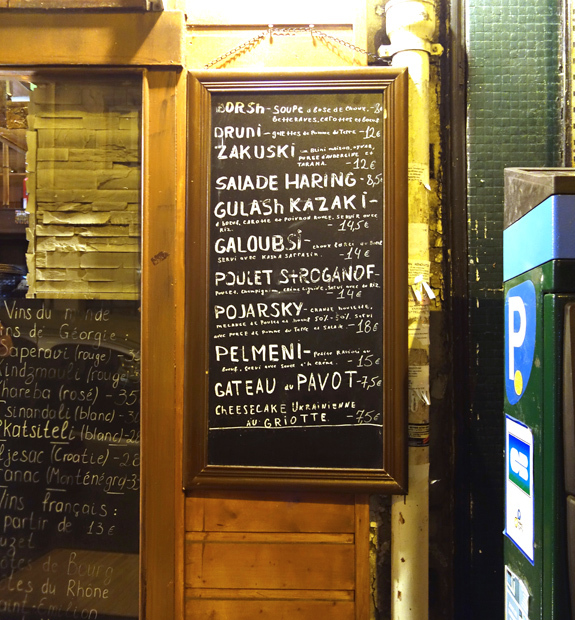 Unfortunately, the only Georgian restaurant I’ve tried in Paris is La Maison Georgienne, and it’s closed now.